Dental Lasers: It is the Focused beam of light which acts on the water molecules of our soft and hard tissues which bring about the desired changes in dentistry. Which cannot be used in every technique but is very effective in most of the techniques where it can be used. The first Dental Laser for soft tissue treatment was invented in 1960. In 1997 the first hard tissue laser treatment was invented with the approval of FDI. Very easy to convince children as a Light toy which is used to treat your tooth problem. As the laser instrument does not touch the tooth and the child dose not even feel the presence of laser. Laser used at a distance gives the numbing effect and when you get the desired effect laser can be bought closer to the tooth to get the desired treatment required of Caries removal or Gum shaping. This gives us the option of Injection free treatment. Preventive dentistry: Laser dentistry when combined with the conventional preventive dentistry techniques has enhanced the effects of preventive measure. Actions of preventive techniques like Fluoride application, pit and fissure sealents etc have more successful results after combining them with lasers. Use of laser on Enamel will help decrease the extent of dissolution of hydroxyapetite with the formation of pyrophosphates which prevent dissolution due to action of Acids. Enamel which was treated by laser is seen to have an increased incidence Fluoride uptake. Use of laser on Root Surface helps in considerably decreasing caries incidence and Argon laser with Fluoride is seen to have very good effect against caries. Cosmetic Dentistry: Laser dentistry is a very effective treatment method in cosmetic dentistry. 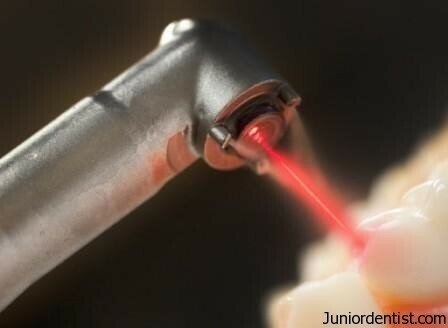 The use of laser is varied in cosmetic dentistry. Drill free Cavity preparation: Many patients who fear dental drill will now be relieved on seeing the dental laser as it does not give out the vibrations or sound we see from a dental drill which increase the anxiety of the patient. Another advantage of laser dentistry is the ability to produce minute irregular surfaces for better adaptation of Composite restorations which is not possible with the conventional dental drill, which increase the surface area. Crown Lengthening procedure: User of laser has improved the healing ability of Gingiva in Crown lengthening procedure and also drastically decreased the time of treatment and the healing time as well to give better results than conventional incisions. Laser Gingival De-Pigmentation: Depigmentation of gingiva has also become very easy with the introduction of laser technology in dentistry. Pediatric Dentistry: Lasers appear more children friendly as they do not have the sound or vibrations of the dental drill which scare the children. They see the laser as a toy and are very comfortable with it. Dental Lasers can be used in Direct pulp capping procedure, dental caries removal, helping erupting teeth. Oral and Maxillofacial Surgery: Dental lasers are used in aiding imapactions with the help of hard tissue lasers which are used in place of dental drill to cut sections of impacted tooth and bone without much tissue damage and the effect of laser which helps in healing of tissue faster than normal. Laser Dentistry in surgery gives us no need of injecting Local anesthesia in some cases, Bleeding less field to operate, no need of dressings, and the most important Laser produces a Sterile environment which is very useful in preventing infections and prevents failure of treatments. Laser dentistry has been known to be very useful in Dentinal Hypersensitivity cases by helping close the dentinal tubules without any invasive procedures and harm to the tooth. All Dentists are not equipped with the proper knowledge or the correct equipment for a effective Laser Dentistry. For effective Laser Dentistry treatment Dental clinics like Smile 60 Price List should be consulted for good dental laser treatment in United kingdom. Enjoying your various topics and discussions. What is your opinion on using laser to do lingual frenectomies? I enjoy this article but what is your reference ?? ?